Lab Report: Wave Secure : May The Phone be with you . Wave Secure : May The Phone be with you . I have been using Mobile phones for close to a decade now. I have changed 5 handsets in last 10 years. But only 2 of those 5 devices were phased out/worn out. Remaining 3 of them were lost, misplaced or stolen. Surprisingly In every single instance of losing a cell phone, my primary concern was not the cost of purchasing a new device. Rather, I was more concerned about recollecting all the data and any potential misuse of information stored on the cellphone. I think that the same would be true for many of us. WaveSecure from TenCube provides a solution to this problem. WaveSecure is a mobile security solution, that allows users to protect data on their phones, ensures privacy in the event of loss of the phone and enhances the possibility of recovering the phone as well. It enables users to remotely lock down, track down and locate lost phones and wirelessly backup a copy of their important data and remotely wipe data off the device to protect their privacy. For a detailed and very engaging description of wavesecure's functionality, I suggest that you have a look at the video embedded below. WaveSecure is a paid application. However you can downloaded a free 7 Day trial version of WaveSecure from OVI store or from http://m.wavesecure.com . Application is of 869 Kb in size. Over a slow GPRS connection, it took me a couple of minutes to download it . Installation was a 4 step process. Unlike majority of mobile applications, installation of WaveSecure is not just a series of clicking "Yes/Ok" on your Cell Phone . It’s a very well thought and well designed workflow . In the first step, the installer asks you to enter your cell number which is verified for a valid and functional number. Then you are asked to choose a 6 digit pin number. Your cell number and PIN are used as your user ID and password on wave secure's web interface. 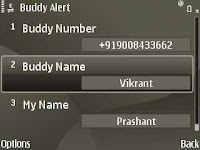 In the next step, you need to enter cell phone number of a trusted friend to whom they can contact (send an SMS) when a new SIM is inserted on your cell. In the concluding step, you get to enter your own email ID for authentication purpose. You can edit these details after installations also, as shown below. Post Installation you can back up your data on the server. Wave Secure provides the option to select what you want to backup. You can also configure wave secure for automatic backup of data. In the event of a theft or loss You can do following things with your device remotely . Remote Lock :You can remotely lock your phone by sending an SMS with “Secure lock” in it. It will lock the device screen and the new owner of your device won’t be able to unlock it without the password. We tested it at our lab and it worked flawlessly. Remote Tracking :You can track the location of your device by sending an SMS to your phone with “Secure Locate” to the SIM in your phone. You can also track your phone’s location by logging on to www.wavescure.com. 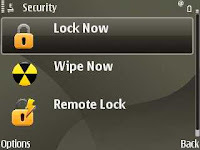 Remote Wipe : You can remotely delete all your content by sending an SMS from Wave Secure portal to your Mobile phone. Another interesting functionality is ”Show My Location Now “ feature where a user can look at her own location on Google Map . I found WaveSecure to be a very well designed application. Solution workflow has been thoroughly thought out and the UI is very intuitive and clean. 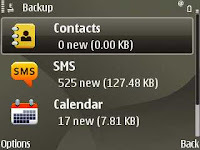 One problem with such solutions I have faced in past was of the need of periodically syncing my phone with server keeping my backup up to date. This has been addressed in scheduled incremental back-up feature. Another concern is of DATA security and Privacy. According to their website, WaveSecure was initially developed for Police and Military use, so it has all the necessary encryption systems and communication security systems that ensure that no one can view the private content of the users, not even the TenCube staff. For a Mobile Security product, they have got good roots I must say. Do give Wave Secure a try and let me know what you think of it? Nice Work dude... I think Spice also has same product develop in J2ME and Symbian... with name SpiceSecure.... not this much features supported at that time. That's a cool application. I have a Samsung E 1410 with some mobile tracker security feature but not the data backup. Will this product work on my phone which supports midlets? Thats a cool app!! but one question pops up.. does it all work by sending sms coz the first thing anyone will do is change the sim if its stolen or lost... and if it works on gprs(internet sync) that may not be available in the new sim as well.. just a wild thought what comes to rescue then..
@Navin : you are right . the theft alert work on SMS only . as you rightly mentioned that GPRS can't be guaranteed on each sim. I am working at tencube and am conducting a study on consumer usage and comments on Wavesecure. Is there any way I can contact you? What are the Essential Apps for your cell phone ?